Identification: Hindwing has 1 long and 1 short tail. 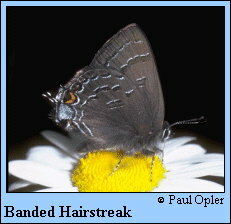 Upperside of both sexes dark brown. Underside of hindwing dark brown with postmedian band of dark dashes edged in white. Blue tail-spot not topped with orange. Life history: Males perch on low shrubs and tree branches during the day, watching for females. Eggs are laid on twigs of the host during the summer, and hatch the following spring. Caterpillars eat catkins and leaves. Flight: One flight from June-August in the north, April-May in Florida. Caterpillar hosts: Many species of oak (Quercus), walnut (Juglans), and hickory (Carya). Adult food: Nectar from flowers including dogbane and common milkweed (preferred), chinquapin, small-flowered dogwood, New Jersey tea, meadowsweet, staghorn sumac, white sweet clover, and yarrow. Habitat: Forest areas and neighboring open edges and fields. Range: Maine across southern Canada to North Dakota; south to central Texas and the Gulf States. Southern Rocky Mountains in Wyoming, Colorado, Utah, and New Mexico.